Last week, Permanent Secretary, Cabinet Affairs Office, Abuja, Georgina Ehuria, a lawyer, was honoured in the city. Dignitaries thronged the home of former governor of Abia State, Dr Orji Uzor Kalu, to mark the event. It was a night of glitz and glamour as high-ranking government officials, politicians, National Assembly members, and captains of industry, among others, gathered for the event. Ehuria, who is from Uzuakoli, in Bende Local Government Area of Abia State, was last year appointed into her new office. 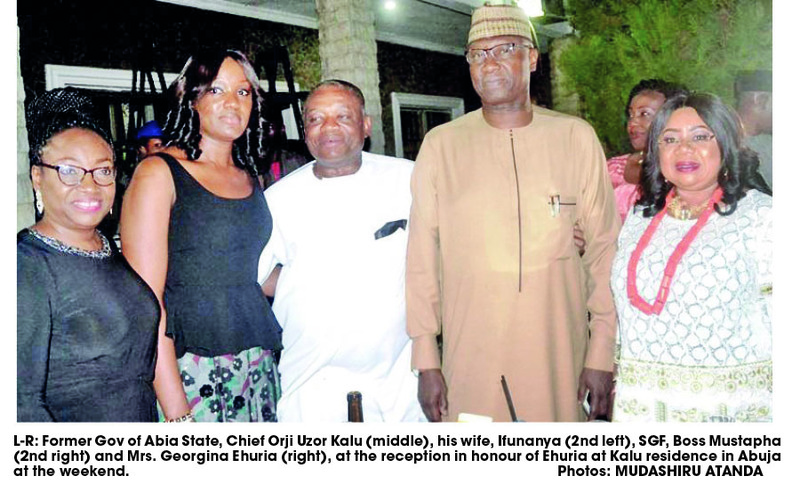 So, Kalu and his wife, Mrs. Ifunanya Kalu, chose to honour her. For her diligence and administrative savvy, Ehuria years ago, was conferred with the Member of the Order of the Niger (MON) in recognition of her selfless service to the nation at the Cabinet Affairs Office. Earlier, she had worked in the ministries of Defence and Education and the Ecological Fund Office among other places. Dignitaries at the event included the Secretary to the Government of the Fede ration, Mr. Boss Mustapha; Head of the Civil Service of the Federation, Winifred Oyo-Ita; Minister of Health, Prof Isaac Adewole; Special Adviser to the President on Media and Publicity, Mr Femi Adesina; Former governor of Ekiti State and All Progressives Congress (APC) Deputy National Chairman (South), Mr. Segun Oni; former Minister of State, Federal Capital Territory (FCT), Chief Chuka Odom; former military governor of Plateau State, Gen. Aliyu Adu Umar Kama (retd); former Plateau State deputy governor, Dame Paullen Tallen; immediate past senator representing Anambra Central Senatorial District, Uche Ekwunife and a former president of the Pan-African Parliament, Mr. Bethel Nnaemeka Amadi. Former chairman, Federal Inland Revenue Service (FIRS), Mrs. Ifueko Omoigui-Okauru, and her husband, Director General, Nigerian Governors’ Forum, Asishana Okauru; Director General, Voice of Nigeria (VON), Osita Okechukwu; Acting Director General, National Commission for Museums and Monuments (NCMM), Mr Emeka Onuegbu; former permanent secretary, Ecological Funds Office and Ministry of Education, Dr MacJohn Nwaobiala, were also in attendance. The diplomatic community also was highly represented. Also at the dinner were the Chinese Ambassador to Nigeria, Zhou Pingjian; Czech Ambassador to Nigeria, Pavel Mikes; Angolan Ambassador to Nigeria, Joachim Quibato; Nigerian Ambassador to Belize, Central America, Ifeanyi Ifedi and a host of others. In his remarks, Kalu thanked his wife for planning what he referred to as a ‘coup,’ adding that the decision to host Ehuria was initiated by her. “Honestly, I want to thank everyone of you for attending this event. May I especially thank my wife who planned this coup that started like a joke. Kalu thanked President Muhammadu Buhari for finding his sister worthy to be appointed a permanent secretary, noting that Ehuria was an exceptional lady. He further said that Ehuria’s appointment had shown that the president was looking towards the people of the South East. “This has shown once again that the president is looking towards us by coming to Bende LGA, our own home, to pick a permanent secretary. And also, we thank the Head of Service; we know it was through her office that this was done. “I thank the Secretary to the Government of the Federation for this noble thing you did for Bende people, to Abia North, to Abia State and to Igbo people. We are very grateful. While we are thanking you, we are still expecting that Mr. President would look more closely to our area. We are not stopping because if we say we are very grateful, they might not remember us again,” Kalu said. In his remarks, the Secretary to the Government of the Federation said he recognised the fact than an icon was truly being celebrated, saying that Ehuria is a woman of substance and an achiever in her own right. “Let me start by acknowledging the fact that we are truly celebrating an icon, a woman of substance, an excellent civil servant to the core,” Mustapha said. The SGF further said that having worked with Ehuria in the past three months, he could attest to the fact that Ehuria has demonstrated skills, expertise and excellence in the work that she has put in. “If you know what she does for the Federal Government of Nigeria, she virtually manages the Cabinet Secretariat and the Cabinet Secretariat is the driving force that keeps the government going because on a weekly basis, the government meets at the Federal Executive Council and they churn out documents and documents, and it is her responsibility to make sure that even the minutes of that meeting are accurately taken and properly done so that when they come again next week, it would have been very, very thoroughly done without waste of time. “Not only that. It is her responsibility to prepare Council documents in its entirety. And by the time we end up with the meeting on Wednesday, her work will just begin that same night to prepare for the next Wednesday. So, she is a civil servant that does not have the luxury of even an annual leave and she has done that with grace. She has done that with dignity to the extent that the government acknowledged the fact, and conferred her with a national honour, MON,” Mustapha added. He further assured Ehuria that there is always a reward for everything done on earth, noting that Ehuria had already acquitted herself. “Georgina, let me assure you that everything you do, you have a reward for it. Not only here, but because you are a steward of your Master, your God, because you are a believer, He says that He rewards those that diligently seek him. I can attest to the fact that even here on earth, you have acquitted yourself. You have accounted for everything that has been entrusted to you and I am confident that even beyond, that account will not be less,” Mustapha declared. Also speaking, the Head of the Civil Service of the Federation, Mrs Oyo-Ita said she was the proudest person at the gathering. She said the story of the selection process of the permanent secretaries in 2017 was in the public domain. “Georgina is of the 2017 set. And sometime back, somebody had spoken about her and recommended her highly to me. Actually, I had forgotten. The 2017 examinations were very, very gruelling. It was the first time that we were doing P-Levels of permanent secretary selection exams, starting from written exams, to the intensive computer assessment test and then, the oral interview. “Georgina came out tops. She did very well. That lady did not need anybody to speak for her. She just did excellently well. And I can tell you that Georgina didn’t just do excellently well because it was an examination, it is her way of life,” Oyo-Ita said. In his testimony, Nwaobiala said one thing that was not said about Ehuria was that she had served so many presidents in the Cabinet Secretariat. “My second posting as a permanent secretary was to the Cabinet Secretariat. And that was where I met Georgina and Georgina is still there in the Cabinet Secretariat up till today. One thing that has not been said clearly is that Georgina has served so many presidents in the Cabinet Secretariat. “When I met her, she had been posted out of the Cabinet Secretariat. I didn’t know her. But my instinct said, talk with Georgina and I called her and we discussed. And I said, you are not going anywhere, you would work with me in the Cabinet Secretariat. But she told me that I must promise her that as permanent secretary, anywhere I am posted to, that she would go with me. And that was it. Georgina became my assistant. We worked in the Cabinet Secretariat and I want to attest that Georgina is a quintessential officer,” Nwaobiala said. On his part, Pedro Madukwe, a cousin to Ehuria, expressed appreciation to the government for Ehuria’s appointment and thanked the family of Dr Orji Uzor Kalu for honouring Ehuria. “She is a very passionate woman, very loving. There is no need you would have and you go to Georgina and she would not do what is best within her ability to do. “Orji Uzor Kalu is our leader in Abia State. He is our leader in Abia North, and he is our leader particularly in Bende Local Government. He was there the day we honoured and celebrated our sister in Uzuakoli on the 29th of December. For him and his amiable wife to also remember to come and repeat it at this level in his house, it just shows that he is a leader from home and a leader abroad. We are so excited,” Madukwe said. Speaking with Daily Sun, Ehuria said she felt delighted and humbled that Kalu, a former governor of Abia State, put the event together to honour her. “In Bende Local Government where we are both from, we believe that honour starts from the home and then goes out. So, being about the most highly exposed person politically from my Bende Local Government Area, I think he, too, saw the need to celebrate one of his own and I feel quite delighted that himself and his wife, called everybody out to celebrate me,” Ehuria said. Ehuria further expressed surprise at the attendance, explaining that she felt it was a gathering of just close family members and friends. Ehuria said the calibre of persons present at the event was an attestation of the goodwill Kalu enjoyed as a person across the spectrum of government. “I want to really thank him for this opportunity. We are quite happy. And my family is very, very happy at this honour that he has done us,” Ehuria concluded.